Here at Summerhill Pools, we take pride in each pool that we design and construct. If you’re looking to have a new swimming pool constructed on your property, we hope that some of our favorite pool projects will provide you with inspiration. Below, we’ve included photos of our recent Leichtle home pool, along with a list of elements included in this job so that you can get some ideas for your home swimming pool. Pools don’t have to be oval or rectangular; Summerhill Pools has a lot of experience designing and building unique freeform pools like the one above. To add to the aesthetics of this pool and incorporate the relaxing sound of flowing water, we added three bubblers to one end of the swimming pool. An added bonus of these bubblers is that they improve the circulation of the water, which discourages the growth of algae and reduces pool maintenance costs. These bubblers are tied directly into the pool filtration system. For the Leichtle job, we installed the newest and best Zodiac ePump for a Variable Speed operation that greatly reduces energy costs over time. There’s also a “weeping wall” on the side – a mini waterfall that also adds to the aesthetics and circulation of the swimming pool. Our customer asked to have this covered table incorporated into the freeform pool, and we were happy to oblige. Do you love the look of richly-colored stone but worry about the price and the slipperiness? As you can see in the photo above, colored concrete is an alternative to stone that doesn’t carry such negatives with it. This custom concrete adds a rich hue to the pool deck that draws the eye – and the swimmer – in. We use SGM plaster to construct our pool surfaces. This manufacturer produces high-end plaster products that are unique and can be custom blended to create unique hues, textures, and colors that are perfect for each pool construction job. For the Leichtle job, we combined their River Rok technology with a dark blue color finish. This leads to water that appears darker and contrasts nicely with a lighter-colored deck. At Summerhill Pools, we employ a professional staff with the skill set and desire to deliver exceptional customer service. The superintendent for this particular project – Dave Jetter – has a passion for delivering exceptional swimming pools within a short time frame. He completed the installation process professionally and in just 3 weeks. 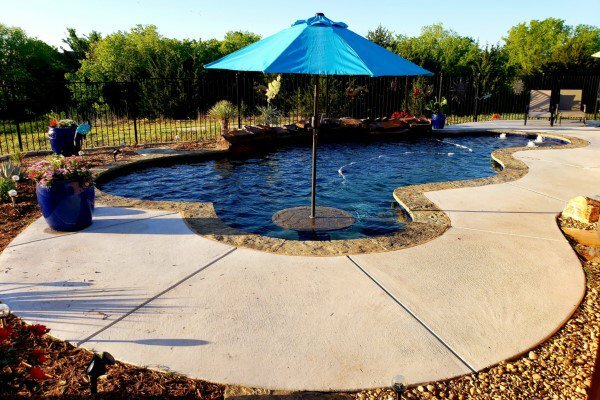 We always use the highest-quality materials when we construct our pools. The Leichtle family will be able to enjoy their pool for many years to come. 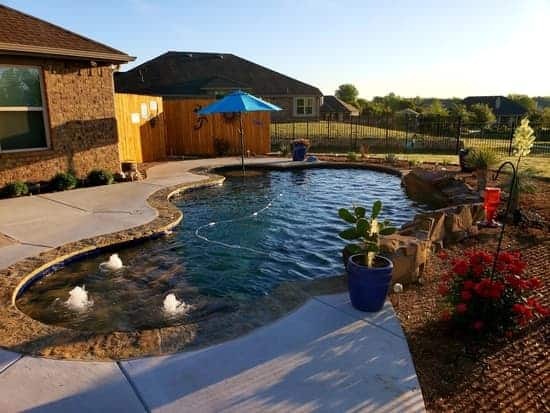 If you live in the Dallas/Fort Worth area and are looking for beautiful pool design, professional installation, and a swimming pool that will last a long time, contact Summerhill Pools today.